I'm a fan of Evie's miniature food creations. Her beautiful work can be seen at After Dark Miniatures or her Etsy shop. When she contacted me for a swap, I happily agreed. I hope that she likes the bunny box, basket and jar of honey. They were fun to make! I can't get over your baskets! They are so beautiful. 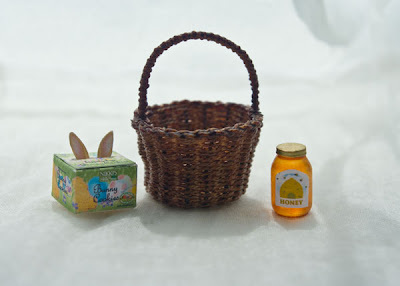 I am sure she will love the bunny box and honey too. I tried making a basket out of the linen embroidery thread and wire. I made a mess of it! Maybe my wire was too soft and too thin. What do you use? Fantastic minis I love them!Evie is lucky! You are really gifted, Carol! Te han quedado preciosos los regalitos, seguro que a Eva le encantan. El color de la miel es perfecto. I LOVE the bunny box. Thank you everyone for your kind comments. Catherine, I used 24 gauge wire for the basket.